A Fine Line: The Beginning by JC Brennan is a fantasy story laced with paranormal elements. The Crew – Union soldier William, Fillmore, Brimmount, Buckner, husband and wife Tyrone and Cecil – is a group bonded by fate. Each of them has a special ability; Tyrone has a gift of healing touch and Cecil is a clairvoyant, and the others also develop their own ‘power’ as the story progresses. The setting is well described; I can easily imagine and hear in my mind the brutal and frenzied war, the hospital filled with wounded soldiers, the travelling wagon, the gunshots and more. The narrative is straightforward and easy to read. The characters are sufficiently complex, well-written, and their relationships have enough depth. For my part, I find the pace is moderate as each of the character's back story is explained. All the same, Brennan gives readers a unique premise by combining fantasy and paranormal factors. Simply put, this is a solid work and a good start for the series. A Fine Line: The Beginning by JC Brennan is a rare combination of real and supernatural. The story takes place at Picket’s Mill during the Civil War. William T. Healthaway is a solider battling on the Union side and his only hope is to return alive, unharmed, and quickly to his beautiful pregnant wife, Caroline, and their three daughters. He is fighting alongside his childhood best friend Buckner. During a particularly bad battle, William sees Buckner go down and he himself is injured and left behind. This is the beginning the real story. William is found unconscious and wounded in a hollowed out tree by Tyrone and Cecil who nurse him back to health. The trio travels to a hospital and find that Buckner is there, alive and healing. The four form an instant bond and are determined to find their way back to William’s plantation and the waiting Caroline. Along the way, they meet several other people and together they form the Crew. Each of the members of the Crew is slowly becoming aware of special supernatural gifts that they have. These gifts become apparent when they are faced with bad guys, wolves and people they meet along the long ride home. 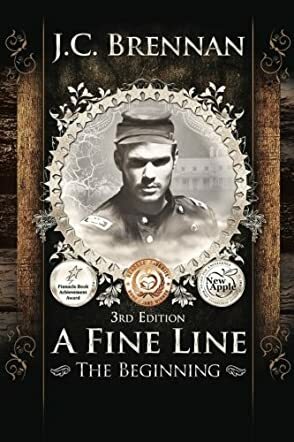 A Fine Line: The Beginning was a very different type of story mixing the real and the supernatural in such a way that it did not seem unusual. Fantasy is not my usual choice of reading, though I always enjoy reading about history. A Fine Line combined these two genres so smoothly as to make it a perfect book. JC Brennan has left me anxiously awaiting the next book as I can hardly wait to see what happens next. This is a surprisingly good historical supernatural story that will keep you glued from beginning to end.